In their discussions of justice, Michael Sandel and Amartya Sen endorse communal good but slight collective endeavor. Every fall they pack Sanders Theatre to the rafters. A spellbinding philosopher takes the stage before a rapt crowd of Harvard students, and soon enough the cavernous space becomes a classroom where the bright shades of Aristotle, Jeremy Bentham, Immanuel Kant and John Rawls are summoned to have their say on the enduring questions. What is the good life? Is pleasure the highest end, or is something else? Are acts moral because they lead to good consequences, or because they are done on principle? To keep the discussion grounded, the class–called simply “Justice,” it now regularly enrolls more than 1,000 undergraduates–is asked to confront these quandaries in the context of hard cases brought to life by the philosopher’s trademark hypothetical situations or policy dilemmas culled from newspaper articles. 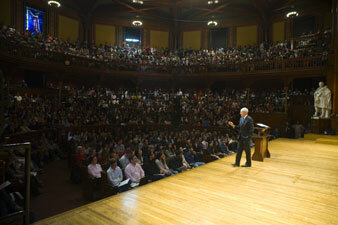 For Michael Sandel, justice is not a spectator sport–at least not in Sanders Theatre, where he expects engagement from the first. He asks a question, and an answer is voiced by an anonymous face in the crowd. Even students too shy to raise their hands are drawn into testing their moral intuitions against prominent theories. The exposure to classic texts at leading universities usually succeeds in giving students the ability to drop canonical names–the sort of cultural distinction elite institutions provide in their continuing role as glorified finishing schools. That Sandel has managed to elevate the conversation is a miraculous accomplishment. Over the years, more than 14,000 Harvard students have participated in it, and now Sandel is trying to broaden the audience. Justice: What’s the Right Thing to Do?, a new book closely based on his course, comes on the heels of the publication of his Justice: A Reader, a selection of essential primary texts. Together with a PBS series based on the course airing this fall, the books allow anyone to follow Sandel’s commentary at home and enjoy a close approximation of a signature Harvard course (without the sticker shock). Since Socrates argued that philosophy must concern itself with human affairs and not just heavenly things, inquiries into abstract justice have revealed as much about their place and time as anything else. (The same is true of the actual pursuit of justice, ever since the Hebrew Bible enjoined it.) As it happens, the publication of Sandel’s Justice coincides with the release of a very different kind of book on the subject–The Idea of Justice–written by his Harvard colleague Amartya Sen, an accident that calls for more than a philosophical discussion. Although Justice doesn’t fully succeed in bottling the formula of Sandel’s class–how could it?–it is easily the most accessible primer on the topic now available. But Sandel aspires to do more than merely vulgarize the available positions in political theory and explore them through contemporary examples: he is calling, as he long has, for nothing less than a reinvigoration of citizenship. As for Sen, his pressing concern is not the lifting of a nationwide malaise but the alleviation of global immiseration, and it drives him to propose a radically different approach to justice. Notwithstanding these discrepancies of interest and scope, however, the two men converge in a striking omission. To make sense of it, one must ask how their theories of justice reflect not just the universal and eternal but also the here and now–most notably, the cold war’s lingering hold on liberal philosophy. Sandel’s book is organized as an excursion through three main theories of justice–one based on welfare, one on freedom and one on virtue–and like the best teachers, Sandel gives each theory its due. But the excursion is also designed to undercut the first two theories in order to prepare the ground for the third. The theories of justice are sequenced like dominoes: the views Sandel rejects fall as the book goes on, and his favorite approach turns out to be the last one standing. Sandel’s discussion of welfare begins with Bentham’s famous definition of justice as “the greatest happiness for the greatest number.” This formulation could justify a commitment to market distribution, if it were shown to be the best means for promoting the general welfare. But pleasure is not the only good, and there is no common measurement for things as different as love and money. In any case, the quest for aggregate happiness also risks running afoul of personal rights. It is absolutely true that personal freedom matters, whether in a libertarian version that insists on noninterference and contract, or more egalitarian schemes–like those of Kant and Rawls–that square individual freedom with equal freedom for all others. Libertarianism, however, is compromised by the mistaken assumptions of self-ownership: if personal attributes–Michael Jordan’s basketball prowess, in Sandel’s example–are themselves unearned, then the earnings that follow from them should not all necessarily flow to Jordan’s bank account. Moreover, no one would base justice solely on consent alone, a point borne out by Sandel’s vivid story of the German man who recently agreed to be eaten. (The fact that he had approved his own death and fricasseeing, the judge unsurprisingly concluded, could not keep his killer out of jail.) Kant and Rawls, for their part, fairly consider the modern aspiration for autonomy but fail to make sense of the claims of loyalty, solidarity and memory. Their thinking is hobbled by the notion of a human being who is a free agent before anything has defined him or her. Sandel concludes by calling for a scheme of justice revolving around the collective good life of virtuous citizens. But from this appeal also flows the principal worry about his enterprise. Sandel plausibly contends that devotion to a scheme of the good life as controversial as collective virtue sets him against the aspiration to neutrality that characterizes much contemporary liberal thought. A full-bodied public commitment to ranking ways of living would suggest that basic values are not necessarily a private matter, as most liberals insist. It would praise virtues and condemn vices, and therefore involve officious interference with autonomy, which is why liberals typically avoid legislating morality. But despite his principled rejection of neutrality, Sandel ends up being rather coy about the exact theory of virtue he is championing, for today’s Americans or in general. To explain his stance, it’s necessary to trace his philosophical roots and consider how he has chosen to define his role as a public moralist in an age especially unaccommodating to his views. Nearly thirty years ago, in his massively influential debut in political theory, Sandel argued that communal belonging precedes individual freedom–that, in his language, the self is “encumbered” and therefore not altogether prior to the ends it chooses. An intrepid technical dissection of his colleague Rawls’s epoch-making A Theory of Justice (1971), Liberalism and the Limits of Justice made Sandel’s name as a “communitarian.” Sandel demonstrated that for Rawls, the freedom of individual choice alone is the morally relevant starting point for inquiry into justice, an assumption that renders things like family ties, religious belief, group loyalty and historical identity irrelevant, except as a secondary extra. Communitarians like Sandel, Charles Taylor (with whom Sandel studied as a Rhodes scholar at Oxford) and Michael Walzer responded that most people, even in liberal societies, prize those things at least as much as personal autonomy. The most attractive part of Sandel’s criticism was his contention that relationships, rather than being the result of previous choices, are the sphere in which identity is possible at all. (To put it in more technical terms, there is no individual subject not intersubjectively constituted from the first.) Ever since making these claims, even as political theory has substantially evolved, Sandel has continued to argue for the priority of the communal good in an account of justice, even as he recognizes its risks for liberty. Those risks are sobering. In the classic ancient model of Aristotle’s thought, which Sandel showcases in Justice, the canonization of virtue depended on a more general belief in a teleologically organized universe, one in which the reasons for the existence of everything, and not simply everyone, came built in. Not only did modern science unseat that view but–as Sandel recognizes–the argument for collectively given ends can be an affront to human freedom. “Communal encumbrances can be oppressive,” he acknowledges. In the precepts of traditional religions, meanwhile, moral obligation and collective inclusion come at the notoriously high price of restrictive moralism, without even Aristotle’s commitment to furnishing a rationale for the code of ethics being outlined. To his credit, Sandel proposes to retain only parts of the ancient legacy for a modern account of justice. Unlike a few of his colleagues–Alasdair MacIntyre, for example, or some Straussians who see modernity as a moral catastrophe–Sandel wants collective virtue to invigorate liberal democracy instead of standing as a full-scale alternative to it. But perhaps what’s most surprising about Sandel’s career is that while he has argued that some vision of the good life must provide the first basis of a theory of justice, he has–given his critique of the aspiration to neutrality–remained surprisingly neutral toward various models of communal morality that might claim our allegiance. The peculiar result is that unlike Rawls, Sandel has abstained all along from offering any programmatic “theory of justice.” He has limited himself to arguing that justice demands collective identity first, without getting specific. There are a few probable reasons why. One is that vague appeals to a good shared in common allow Sandel to build a broad coalition while postponing inevitable disputes about its precise mission. It offers the false sense of a common agenda to people who in fact do and should differ. Nowhere is this clearer than in his sympathy for potential religious sources of collective ideals. Sandel recognizes that in contemporary America the priority of communal virtue is most appealing to the religious right, and his hymns to community often contain strong hints that religious perspectives could or should help define it. This approach will not satisfy those who need to know the exact moral dimensions of a religiously inflected definition of the good life before agreeing to its public endorsement. Should one champion the injection of religion in collective politics without first being clear about what it would really mean? This concern is pressing even for the right, but it is especially serious for the left, where Sandel’s sympathies seem to lie. Progressives, he warns, are mistaken to react to conserva-tive appeals to “values” by opposing all such talk as intrusive instead of providing their own better set. He writes in Justice, as he has written before: “Fundamentalists rush in where liberals fear to tread.” Clearly, his heart is with a reinvigoration of liberalism based on appeals not simply to morality generally but also to religion specifically. “Not only the Taliban, but also abolitionists and Martin Luther King, Jr., have drawn their visions of justice from moral and religious ideals,” he explains. And most revealing, Sandel is thrilled by Barack Obama’s praise for the necessary role of religion in American politics. Yet Sandel never squarely addresses the hard question of how to make religion a valuable source for progressive change, nor does he take up the question of whether it’s justifiable to emphasize the progressive rather than conservative strains of existing religions, in their own moral doctrines or in contemporary politics. Sandel is probably right that Obama’s elevation of religion as a moral source in contemporary life is good politics. But it is only “good political philosophy,” Sandel implies, if a thinker is willing to engage in a contentious struggle to explain why religion can and should be freed from its distant past of subjugation in the name of revealed truth, and its recent history of conservatism in the name of the “moral majority.” In an era of so-called new atheism, in short, it remains surprising to see Sandel frequently gesture toward the moral dimensions of religion when a defense of the moral credentials of religion, including his explanation of how to endorse one version of religion rather than another, is nowhere to be found in his writings. All things considered, it would be foolish to rush in just because fundamentalists do. What is true of Sandel’s strategic or vague endorsement of religion as a fund of collective morality is true of his general approach to justice. It need hardly be stated that there are secular visions of the common good that compete with various religious ones. Despite continuously advocating a politics of the common good, Sandel offers next to no means to help decide which of many rival proposals about the morally preferable life for people in common is best. It is all very well to champion a renewed citizenship, but–especially for a critic of neutrality–not without some more contentious indication of its foundation and implications. There is likely a historical reason for Sandel’s reticence. His first appearance in the New York Times, long before he became a professor who contributed op-eds on moral issues in contemporary politics, was in 1975, as part of the paper’s spring review of commencement speeches. In his valedictory address at Brandeis, Sandel bemoaned the passing of the activist spirit of the 1960s, with its notion of citizenship wedded to public engagement and reform. It had already given way, Sandel ruefully noted, to moral “emptiness,” as attention shifted “from the shortage of good in the world to the shortage of goods.” Sandel has often invoked Robert F. Kennedy as the politician who promised to make virtuous citizenship, rather than rights and markets, the compass of liberalism. Strikingly, Sandel is still making the case decades later, but at a time when large social movements are even more of a dim memory. Absent new models, the nostalgia for a collectivist model of liberalism has been Sandel’s fate, more than his choice, in an age of conservative ascendancy. His attempt to shelter a guttering flame–if that is what in fact defines his role as public moralist–would be honorable, except that it critically affects how he has thought about justice, and taught it. Leaving aside what are either strategic feints toward religion or unacceptable failures to explain why religion should cut left instead of right, Sandel has ended up aligning his collectivism with Aristotle’s ancient virtue ethics rather than the modern social movements that inspired him. Correspondingly, what’s glaringly absent from Sandel’s otherwise generous survey of theories of justice is the approach to the subject that has been the dominant one in modern times in the West, especially on the left and among social movements: justice as collective freedom and empowerment. In his rambling over the territory, Sandel presents theories of justice that champion freedom as the basis for personal rights–or at most, egalitarian norms. In principle, for Sandel, the communitarian alternative is necessarily a strike against freedom rather than a theory of it. Absent from his canon, similarly, are philosophers like Jean-Jacques Rousseau, G.W.F. Hegel and their followers, for whom ancient virtue could not be revived without reinventing it as a doctrine of collective emancipation. Sandel seems, in fact, to long for this tradition (he has mentioned Hegel, and had warm praise for his follower John Dewey, in other contexts). But he has opted not to advocate for it, or even make room for it, in the survey of Justice. The Idea of Justice is a very different book: Amartya Sen offers a theoretical argument so richly and lovingly detailed that its central objective has to be teased out of a tangle of specialist debates and engrossing digressions. At the end of his book Sandel insists that the scandal of economic inequality is one of the principal reasons to mobilize for the collective good; but apart from a tangential affirmation of local solidarity, he shows little interest in the issue of transnational justice, notably the battle against worldwide poverty, even though it is today the burning topic in the field. By contrast, a major feature of Sen’s approach is his introduction of what he calls “global perspectives” into discussions of justice. He blends an expansion of geographical scope with a theory that insists on a more realist brand of reform, in which political theory is not about drafting blueprints for castles in the air but comparing feasible next steps for improving the world as it stands. Sen, who is a generation older than Sandel, was born in 1933 in the town of Santiniketan in West Bengal, the home of the educational utopia founded by the Indian poet and humanist Rabindranath Tagore. (Sen’s mother was a disciple of Tagore.) In a career spanning nearly half a century, Sen has scaled the peaks of Anglo-American academia, enjoying long spells at Oxford and Harvard, where he teaches today after a recent interlude as a Cambridge don. A Nobel laureate in economics, Sen confesses that philosophy is his “love affair.” Even as he has thrown himself into criticizing the assumptions of his home discipline, he has profoundly shaped the field of development at the United Nations, where he has campaigned against the inadequacy of a narrow GDP measurement of well-being. And all along, Sen has pursued the more abstract problems of academic political thought at a very high level. Though The Idea of Justice is much more a synthesis of his disparate contributions to the field than a fundamentally new theory, it is clearly the place to start for ascertaining how his views fit together into a unique and inspiring position on justice. Sen has little use for Sandel’s communitarianism. He sees in the diversity of cultures not challenges for universalism but historical sources of its precepts, and he likes to cite Indian traditions as authority for his moves within Anglo-American liberalism. (Akbar, a Mughal emperor in the sixteenth century, has Sen’s special admiration for his commitment to pluralistic toleration.) Still, like Sandel’s earliest work, The Idea of Justice is essentially an analysis and criticism of John Rawls’s political thought. And in retrospect, it seems clear that after successive utilitarian, libertarian and communitarian waves of assault on Rawlsian liberalism, it is the demand for global justice that has proved to be the most serious undoing of Rawls’s system. Even Rawls’s faithful disciples, like Thomas Pogge of Yale, were appalled when, late in life, the great Harvard philosopher confirmed that he thought about the nation-state as the natural forum for justice, with international justice a secondary consideration and mostly reduced to a minimalist humanitarianism. In response, Pogge and others have maintained the essentials of Rawls’s thought–most of all, his social contract–but altered its scope. In a cosmopolitan age, they argue, everyone in the world must be seen as parties to the bargain over the principles of justice. National boundaries are merely the legacies of an arbitrary history rather than the bright lines of any fundamental moral map. Sen does not dispute the limitations of Rawls’s complacency in an era of globalization. But, like his onetime associate Martha Nussbaum, he thinks the problem of global justice requires a very different fix to Rawls’s system–in some ways, a more profound one. Of the many arguments Sen offers, his weightiest is a defense of “comparativism” against Rawls’s “transcendentalism”–the reckoning of next steps as superior to the perfection of blueprints. Indeed, Sen contends that the wishful desire to promote a principle of global justice surpassing nations reflects too much allegiance to Rawls’s commitment to ideal schemes. Sen impishly wishes Pogge “good luck” in simply transferring Rawls’s social contract to the global forum, in the absence of the robust coordinating authority of a world government. Recommending a different course of thought, Sen argues that if a theory of justice is concerned not with outlining distant utopias but with deciding among proximate alternatives (especially when they rule out manifest wrongs), the persistence of national politics need not be a fatal objection to the pursuit of cosmopolitan improvement. Political constraints that rule out global equality in a world of nation-states fade in their theoretical significance if justice itself is understood not as a system built from scratch but as a choice among options available in the world as it exists now. The most fascinating passages in The Idea of Justice, therefore, are ones in which Sen methodically makes the case that “transcendent” utopias of the Rawlsian sort are neither possible nor necessary. One set of arguments says that theoretical agreement over first principles is not available–certainly not of the kind Rawls famously promised with his “original position,” which imagined an ideal situation of choice (which Pogge and others transfer upward to the global scene). “A diagnosis of perfectly just social arrangements is incurably problematic,” Sen insists. Anyway, he then argues, even if such a diagnosis were available, it is unclear how it would help, since policy choice is always between two or more proximate alternatives, and a revolutionary utopia would provide no guidance about which foot to put forward first. More specifically, neither theoretical agreement nor any particularly grand scheme is needed to identify egregious wrongdoing. Finally, people’s behavior is inescapably relevant to the reformer, making theories that fail to reckon with it useless. Such arguments have an obvious appeal as a recipe for drafting a step-by-step agenda for the pursuit of justice, and Sen goes further in recommending his discipline of social choice (distinct from the very different academic enterprises known as rational choice and public choice) as a tool kit for analyzing different political options comparatively. As brilliantly carried off as it is, however, Sen’s refutation of “transcendence” is unconvincing on a number of grounds. Most of all, it fails to acknowledge the diverse roles that theoretical options, beyond proximate, realizable ones, play in theory and practice. In a somewhat technocratic mode, Sen treats the options presented in public debate as given in advance, as if coming up with a menu of options did not require inspiration. But even if Sen is right that transcendent schemes can play no direct role in adjudicating between local alternatives, it seems obvious that they have an important effect in helping to precipitate those alternatives. Much more important, utopias have always galvanized people to advocate even piecemeal reform in the unjust circumstances of the world as it is. Sen wants to reach the conclusion that the “hiatus” between his “relational approach” to justice and the “transcendental approach” is “quite comprehensive,” but he completely ignores the value of the transcendent as providing a fund of ideas and motivation. It is key to both the theoretical elaboration of and the practical quest for even proximate reforms. Thus, even if Sen is right that a fetish for a “complete” blueprint of social justice is a distraction, it does not necessarily follow that confining inquiry into justice into a discussion of proximate options is the sole alternative. One of the attractions of his approach, of course, is that it provides a warrant for dropping scholastic controversy so that rival schools can converge in alleviating “manifest injustice.” But even such consensually supported goals have to be defined; even a world without slavery, to take Sen’s favorite example, had to be imagined, and the energy for its achievement summoned and mobilized. It’s also worth stressing that Sen’s approach works best when the injustice at issue is a geographically local or chronologically episodic one. The sad devastation of a hurricane or even a widespread horror like human trafficking call for interventions that, no matter how difficult, are confined to the outrage at hand. Of course, such upheavals can end up revealing structural wrongs the public had preferred not to see–as in the aftermath of Hurricane Katrina. All the same, responding to a fundamentally systemic injustice like global poverty is inseparable from a more controversial positive agenda, in theory and practice; in modern times it has typically been a positive agenda of collective freedom. The main reason is that the campaign for social justice, especially on a global scale, intrudes too profoundly into the fundamentals of existing social arrangements not to make the most basic questions of justice pressing, and the rivalry of what one might call comparatively transcendent schemes hugely relevant. In Sen’s thought, his famous proposal–further developed here–to make self-realization in all its multifaceted forms, or “capabilities,” the metric of justice could not but prompt an open-ended campaign for improvement far beyond assuaging the crying shame of manifest deprivation. In this regard, Sen has just as interesting, if not as vexed, a relationship to modern social movements as Sandel. Large-scale mobilizations are arguably at the heart of what both imagine justice to involve, but they are not as well integrated into the theories as Sen and Sandel think. Sen acknowledges that indignation, not just argument, matters in imagining justice, though he concludes that such emotion is relevant only insofar as it can be translated into a comparison of available reforms. Just as Sandel praises the moral and even religious basis of campaigns for slave emancipation and civil rights, Sen cites them as examples of movements that abolished glaring evils. Sen has notably kind words for the alternative globalization movements of recent history. It is very doubtful, however, that such movements have worked by confining their claims to proximate fixes alone instead of by imagining distant utopias. The reverse is true, both throughout modern history and in recent times, as the slogan of alternative globalization–“another world is possible”–suggests. It is better to think of local comparison and grandiose ambition not as mutually exclusive, as strict alternatives, but as mutually necessary. Like Sandel, finally, Sen is so wary of the definition of justice as social freedom that he fails even to acknowledge it, despite its modern standing and appeal. Sen repeatedly indicts Rawls’s absolute preference for the value of personal liberty over “economic or social equity”–it is “extremist” and “overkill,” he says–but only to emphasize a moderate version of it rather than to dispense with the dichotomy between liberty and society. Sen’s dichotomy is a version of Sandel’s: collective life is a means for the advancement of personal capacity and freedom, and no more. For all their legitimate striving for participation in the eternal concerns of Plato and the Bible (and Akbar), Sandel and Sen are writing for a world in which academic philosophy has clearly taken on board the liberal victory over communism in the cold war and allowed it to shape the terms of the debate. (If there are figures in academic political philosophy who are exceptions, like the recently deceased G.A. Cohen, they are ones that prove the rule.) Whether or not the marginalization of justice as collective freedom is defensible, the striking fact is that for Sandel and Sen it just goes without saying. If liberalism deserved to win its battle to the death with communism, the resulting constraints on liberal political thought are nevertheless not easily justifiable. The consensus is all the more striking since philosophy is intended to be more than a creature of its moment: it is not supposed to restate temporary biases as universal truths. While critical of the promulgation of “sterile utopia” in his field, Sandel acknowledges the risk that philosophy could degenerate into an apology for its time and place: “a self-consistent skein of prejudice,” as he puts it. That risk will strike you as rather serious after reading these books, if you think the viability of an account of justice as collective freedom was not exclusive to communism and therefore did not expire with it. There have been, after all, democratic approaches to collective emancipation and social freedom, notably in the Anglo-American age of progressive reform, as well as around the world. At the same time, the end of the cold war has forced liberal philosophy to reckon with phenomena it has not been particularly well suited to incorporate, in the variety of its revisions of and departures from Rawlsian thinking: most of all, the claims of diverse cultures and the deepening of scandalous economic inequality on a global scale. These phenomena are novel only for contemporary liberalism, not for other philosophical traditions or in the lives of ordinary people. Sandel and Sen have tried to adapt to these circumstances by plotting a different theoretical course, but it is one beset by a great tension. They esteem social movements as the most vital tribunes of justice but fail to honor the aspiration to collective freedom that has so often animated them.